Get out of nearly any jam while you’re on the highway with this great preparedness kit. 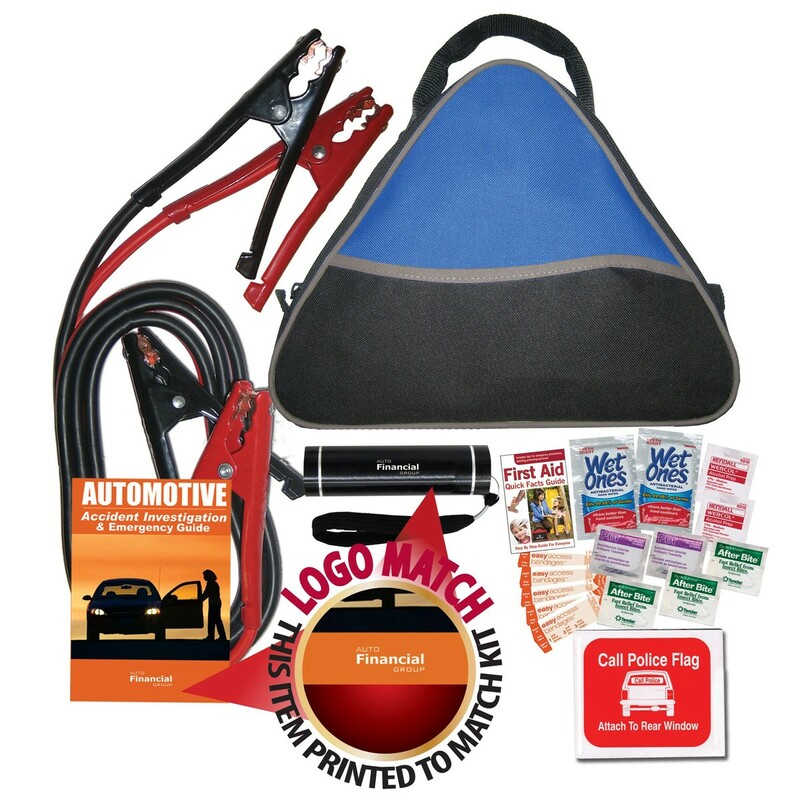 Choose from red, royal blue or blaze and add your organizational or corporate emblem or logo to create a fine branded promotion that’s sure to please drivers of all persuasions. It’s a great raffle or giveaway for auto dealers and car shows. This kit includes 1 Pair of 250 Amp 10 Gauge Jumper Cables, 1 LED Flashlight w/ Batteries & Imprint (Imprint Area: 1.5" x .44"), 1 48pg Auto Emergency Guide w/ Imprint (Imprint Area: 1.5" x .44"), 1 Call Police Banner, 2 Wet Ones® Wipes, 5 Bandages, 3 After Bite® Sting Swabs, 1 First Aid Quick Facts Card, 2 Alcohol Wipes, and 2 Antiseptic Wipes. Includes a 1 color screened imprint. Setup - $60.00R per color. PMS Color Match - $25.00R per color. Additional Color Run Charge -$0.50V. Imprint Area - 5.5"x2.25". Product Colors: Red, Royal, Blaze.